The three-member panel, headed by Canadian Judge Marie Deschamps, handed over its more than 100-page report Thursday to U.N. Secretary-General Ban Ki-moon, who made it public. “While I may not agree with every assertion in the report, I accept its broad findings,” Ban said in a statement. FILE - Former Canada Supreme Court Justice Marie Deschamps speaks in Ottawa, April 30, 2015. Deschamps headed a three-member panel that found a U.N. probe of allegations of sexual abuse by peacekeepers in CAR was “seriously flawed." The report assesses U.N. action -- and inaction -- in the spring of 2014 when allegations of sexual abuse of children by peacekeepers came to light. 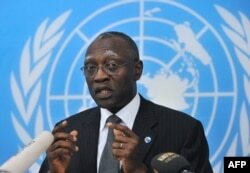 The panel criticized Babacar Gaye, the head of the U.N. mission in C.A.R. when the allegations surfaced, for failing to take serious steps to end the abuses or report them to senior U.N. officials. The secretary-general dismissed Gaye in August. The report strongly criticized the head of the human rights and justice section of the mission for "abuse of authority," for not protecting children at risk and for encouraging Gaye to “keep the allegations quiet.” The panel said these actions exposed children and potential other victims to repeated assaults. FILE - General Babacar Gaye, the U.N. secretary-general's representative to Central African Republic, speaks at the BINUCI (United Nations Integrated Peacebuilding Office in the Central African Republic) headquarters in Bangui, Feb. 6, 2014. Three senior U.N. officials in New York were also faulted for not following up appropriately. Only one, the Special Representative for Children in Armed Conflict Leila Zerrougui, is still in the organization. However, the review panel said actions taken by High Commissioner for Human Rights Zeid Ra’ad al Hussein and Peacekeeping Chief Hervé Ladsous after they learned of the allegations did not constitute abuse of their authority. A senior U.N. human rights official, Anders Kompass, was temporarily suspended for bringing the allegations to the attention of French officials. The review panel cleared him of any wrongdoing. Kompass helped to make the allegations public. U.N. officials are quick to note that the organization has a policy of “zero tolerance” for sexual abuse and exploitation by staff or peacekeepers, but continued allegations in the C.A.R. mission over the past year expose the flaws in implementing this policy. One difficulty is accountability. The U.N. lacks the authority to prosecute international soldiers and police accused of abuses while under its command. It can send a peacekeeper back to his or her home country, but then it is up to that government to prosecute or discipline the individual. Sometimes justice is never pursued. It suggested the organization consider adopting the model followed by NATO, which in some cases allows a host country to prosecute when the alleged perpetrator’s government does not. The panel also recommended that alleged abuses by peacekeepers should be seen as a form of conflict-related sexual violence, and addressed under U.N. human rights policies. The authors also urged creation of a team of specialized investigators for future abuse allegations, and the payment of compensation enabling victims to receive specialized services. But he noted that some of these recommendations would require the involvement and approval of member states.